Damien Chazelle and Ryan Gosling's latest collaboration about Neil Armstrong's journey to become the first man on the moon is solid but not out of this world. At the age of 33, director Damien Chazelle has been labelled as Hollywood’s darling. His gripping and electrifying second feature, Whiplash, showed everyone how to make a gritty movie based around music, and La La Land, the winner of 6 Academy Awards, brought back a healthy appetite for original musicals. Now Chazelle has changed genre all together, moving to space travel and the subject of Neil Armstrong with his latest feature First Man, a biopic that honours his legacy and is very likely to be in the running for many awards come the turn of the year. Based on James R. Hanson’s official biography of Armstrong, Chazelle’s film chronicles the astronaut’s life between 1961 up to the first moon landing in 1969. Whilst portraying how Armstrong (Ryan Gosling) was training for the biggest moment of his life, it also examines the Armstrong family and the impact of Neil’s career on his wife (Claire Foy) and sons. It’s these two narrative strands which make up the film’s hefty running time, and both the former and latter are given a fair balance and for good reason. It’s commendable that scriptwriter Josh Singer has managed to find complexity in Armstrong’s story, giving Ryan Gosling’s performance an added level of fascination. From the outset, he is a family man who loves spending time with his children and Janet but also has the recent trauma of their daughter Karen who passed away from a brain tumour. However, he slowly isolates himself from them due to the impending possibility that he may never return from space – a terrifying prospect to induce. It’s this slow transition that Gosling expertly handles and it makes for a conflicting but memorable portrayal. Also as memorable is Claire Foy who puts in an awards-worthy performance as Janet. She provides an emotional core to hold onto against an emotionless Neil during the film’s latter half, forcing him to sit down with their sons the night before his departure to the lunar surface in a heart-wrenching moment. It’s a standout scene because it shows the consequences Neil’s mission will have on his beloved ones, which is one of the film’s great strengths. ‘There are risks, but we have every intention of coming back’, Neil says with a sigh whilst his son Rick replies, ‘but you might not’; it’s beautifully played out and reminds us that the Apollo 11 mission was extremely risky at the time. As well as the performances, First Man‘s attention to detail is exquisite. Production designer Nathan Crowley creates an environment that truly captures the time period, heightening the intensity of the film. Most impressive of all is the use of authentic NASA equipment and technology, particularly the vertiginous ‘multi-axis trainer’ that is both fascinating and nausea-inducing to watch as Armstrong spins around inside a tiny capsule. It’s an example of what a biopic can do best: provide greater insight and spark greater curiosity within its subject matter, and this is a box which Chazelle greatly ticks. 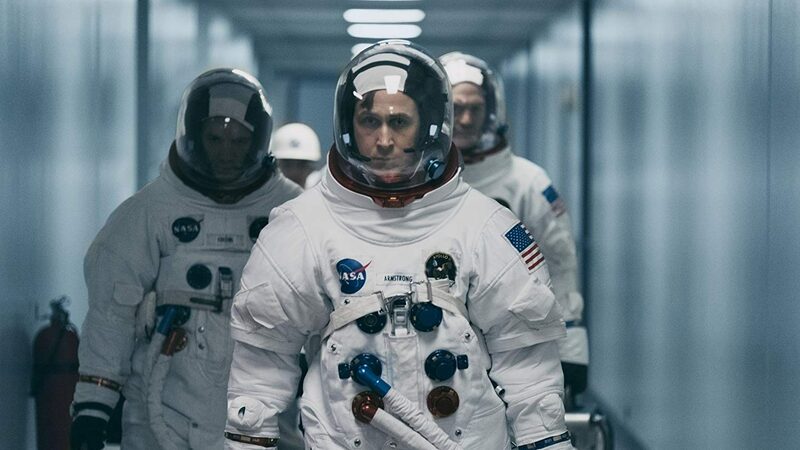 With that all being said, there is a whiff of familiarity in terms of structure that stops First Man from being another Damien Chazelle great. Although he directed arguably two of the best music genre films in the last decade, the biopic has been mastered before by preceding directors and many of the genre’s conventions are retreaded upon here. The still shots on the sides of spacecrafts are reminiscent of Christopher Nolan’s Interstellar, and the score by Justin Hurwitz veers from the alienating sounds of Vangelis to the patriotic fanfares of John Williams. Structurally, it sinks into a repetitive nature that can feel tedious if you are not engaged with the events onscreen, and whilst the film looks spectacular and has many emotional punches to go with it, First Man lacks the freshness which Whiplash and La La Land thrived upon. However, despite some of its formulaic attributes, the film’s climax is one that conjures goosebumps of wonder and amazement. It’s a noble tribute to one of the greatest men who ever lived and when Gosling says the famous line with remarkable accuracy, it is spine-tingling. First Man does not reinvent the wheel, but rather solidifies Chazelle’s status as one of the most exciting filmmakers in Hollywood today. Whether it wins any awards is questionable, but it is sure to be among the mix. First Man (2018), directed by Damien Chazelle, is distributed in the UK by Universal Pictures International, certificate 12A.